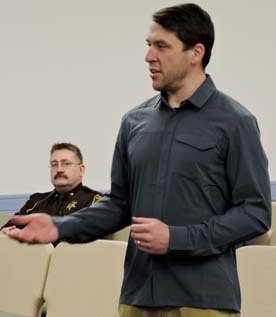 Garrett Neese/Daily Mining Gazette The Houghton County Board discusses the formation of a task force for exploring options for replacing the Houghton County Jail at its monthly meeting Tuesday. HOUGHTON — U.P. Engineers & Architects will provide construction cost estimates for three options for replacing the Houghton County Jail. The County Board approved a $9,600 contract with UPEA at Tuesday’s meeting. •Renovating Camp Kitwen, a former low-security state prison that closed in 2009. The facility has been without heat or power since. •Building a new courthouse and jail complex in Houghton. Along with the jail and sheriff offices, the building would also house courtrooms, court offices and the county’s administrative offices. Under state law, the county sheriff’s office must be in the county seat. •Building a jail and sheriff offices on county-owned property on the west side of Dodge Street. The estimate will include an option to add district court facilities, as with the proposal put on the 2010 ballot. •Updating the cost estimate for the jail addition on the 2018 ballot. That proposal would have put a jail addition behind the courthouse at the current site of a parking deck. The fee proposal includes a pre- and post-estimation meeting with the county’s jail task force, a tour of Camp Kitwen and recommendations for construction, and construction cost estimates for the four options. 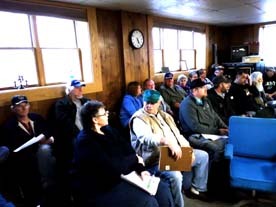 Chairman Al Koskela, Commissioner Tom Tikkanen, Commissioner Glenn Anderson and administrator Eric Forsberg held a meeting with the state Department of Management and Budget about Camp Kitwen, Tikkanen said Tuesday. “As a result of that, the wheels are turning for gaining some access and an updated report on that property,” Tikkanen said. The state informed them a 2016 Senate bill authorized the sale of Camp Kitwen as surplus property. Commissioners said the auction of the property had been authorized for this spring but was pulled back to allow an inspection of the facility first. The property was appraised at $75,000 as is, Anderson said. Another report found “significant” mold issues with the property, he said. Tikkanen said all municipalities in his district had received a letter requesting nominations for the task force. Several have already acted, he said. A handful of municipalities have sent official word of their representatives on the task force, Forsberg said. Meetings of the task force will be open to the public. Forsberg said the board will need to outline what it wants from the task force, how often it should meet and when it should make recommendations. Anderson said getting cost estimates from UPEA will be the first step. “Then we have something for the committee to weigh in on, the pros and cons of each option with the cost estimates to back them up,” he said.